Parmigiano Sauce Recipe info about the game-Games2Rule. Chris has remained home alone because his family went on a holiday in the States. He is sick of eating sandwiches so today he is about to cook a parmigiano sauce recipe. Lets show him how to cook something delicious because he is really hungry. 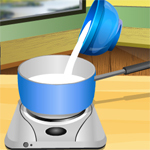 Enjoy playing this online cooking game for girls.